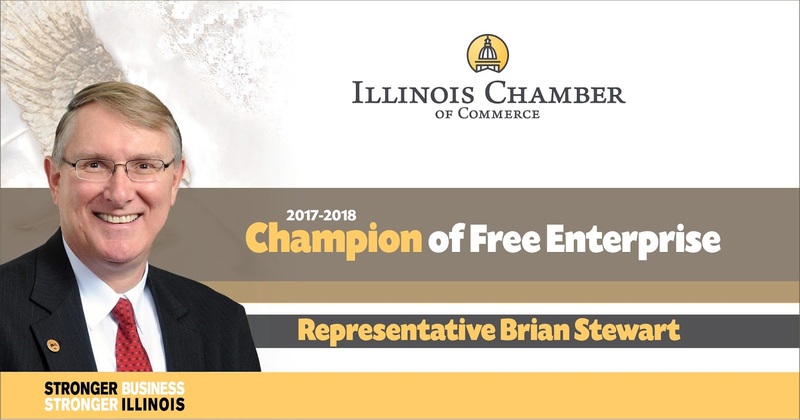 Representative Brian Stewart (R-Freeport) will be honored by the Illinois Chamber of Commerce for his pro-jobs voting record over the past two years in the Illinois General Assembly. Many of us understand that we cannot tax our way out of this mess in Illinois, but with better policies towards business, we can grow our way out of the mess were in, said Rep. Stewart. I am proud to be one of those legislators fighting against job-killing policies and fighting in favor of smarter growth and development. The Illinois Chamber honored 34 members of the Illinois House, including Stewart, and 13 members of the Illinois Senate with its biennial Champion of Free Enterprise award given in recognition of legislators support for voting to further economic opportunities for Illinoisans. The Chambers Legislative Ratings lets Illinois families, small businesses, and taxpayers know if legislators voted in favor of private sector job creation and a stronger economy, said Todd Maisch, president and CEO of the Illinois Chamber of Commerce. The Illinois Chambers Legislative Ratings tracks votes important to the states business community and grades legislators based on their support of pro-business issues during the two-year legislative session. Rep. Stewart has an average score of 90% over his past two terms. To be eligible for a Champion of Free Enterprise award, a lawmaker must have received an average of 85 percent or better voting record over the previous two General Assemblies with the Illinois Chamber. To learn more about the ratings and bills included, please visit the Illinois Chambers website at http://ilchamber.org.